Every year we do this "Horror Month" thing. 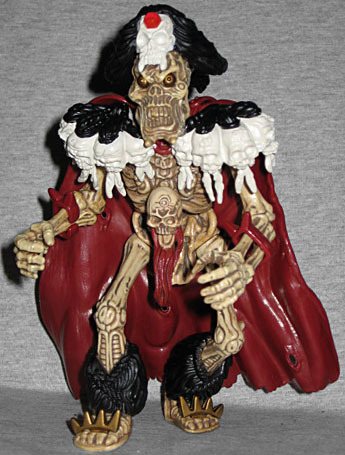 And every year, I plan to review a Skeleton Warriors toy. The fact that the last one we actually reviewed, Aracula, was in 2002 should tell you that I don't every time get what I want. A ruthless tyrant who commands the Skeleton Legion, Baron Dark possesses inhuman super strength. Equipped with an arsenal of bone-crushing weapons. Dark stalks Prince Lightstar and The Legion of Light. Armed with the power of his DarkShard Sword, his Baronic Blaster and his Bone Battle Axe, no one is safe from the wrath of the Skeleton Legion's Evil Warlord. Dark's greatest power is the ability to change others who are evil of heart into living skeletons. Baron Dark will stop at nothing to gain control of the Lightstar Crystal and forever dominate Luminaire. 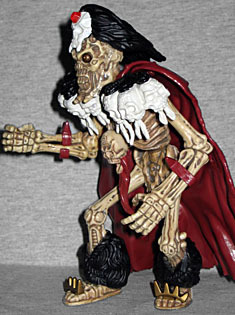 If Skeleton Warriors was to be a "He-Man" for the '90s, then Baron Dark was its Skeletor. Which I guess is rather redundant, since Skeletor was already a mystical man with an exposed skull for a head and an eye (socket) toward conquest. But hey, nobody ever accused Skeleton Warriors of being overly original. Baron Dark did not just have the flesh stripped from his bones and call it a day: clearly being exposed to the shattering Lightstar changed him in many ways - unless he really did have two giant spikes coming off the front of his chin before being skeletonized. In the cartoon and comicbook he also had big fangs, but the toy leaves him with normal square teeth. You can definitely tell that Baron Dark was a Playmates product. Think back to the original 1980s Teenage Mutant Ninja Turtles toys, and how very pre-posed those toys were: Baron Dark has the same problems, which are made more frustrating by the fact that you can't get both his feet flat on the ground at once; luckily the big cape he wears is long enough to touch the ground, so it helps him balance. He's got a very hunched pose, with bent legs and a curved spine. 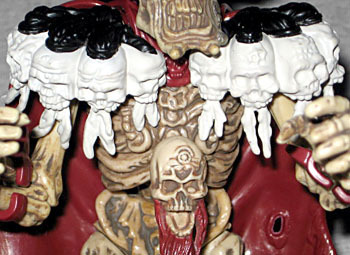 The detailing on the bones is all very impressive - they're not quite anatomically accurate, but they capture the "feel" of bones, you know? He swivels at the head, shoulders, waist and hips. In case being a giant, living, magic-wielding skeleton wasn't terrifying enough, Baron Dark's outfit should finish the job. We already mentioned the tattered, blood-red cape, but he also has spikes on the tops of his shoes, large furry bundles around his shins, and shoulderpads made of bleached white skulls that are tied together by their hair. Creepy! He has a loincloth that's the same color as his bones, weirdly enough, but the spiked bands on his forearms are the same color as his cape. He wears a fanged skull as a headdress, which also has a red crystal on its foreahead - the shard of the Lightstar that gives him his powers. Finally, he wears a bearded skull on a chain around his neck. You have to wonder: who is that unlucky fellow? Is it the former king? The head gets a point of articulation, so it can swing back and forth. Baron Dark comes with three weapons, all of which are typical Playmates goofiness. You know, the kind that's sculpted with all sorts of extraneous detail, but gets no paint apps to bring out those details. His "Baronic Blaster" is a large blue rifle with a skull near the barrel and a stock that looks like a spine and finger bones. The "Bone Battle Axe" is a lighter blue, with a horned skull, spikes on the ends and a large blade off the back. Finally, the "DarkShard Sword" is a green thing that fires a red missile. Yeah, none of them are great. Skeleton Warriors was a failure, for reasons we've discussed before. But the characters and the designs are all cool enough that it would be interesting to see updated versions. It was 1994 when the line premiered at Toy Fair, so the nostalgia cycle would theoretically be ready for them in 2014. So come on, Playmates, get the hype machines going! You can still turn Skeleton Warriors into a success, because horror is hotter now than ever.